Front: 21.14 in (537 mm). Rear: 19.17 in (487 mm). 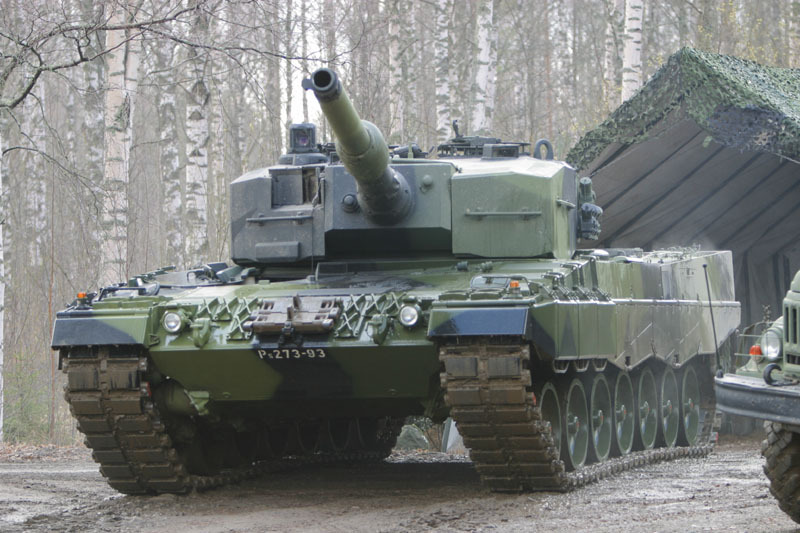 120mm L44 (M256) smooth bore gun Turret; manual loading 42. 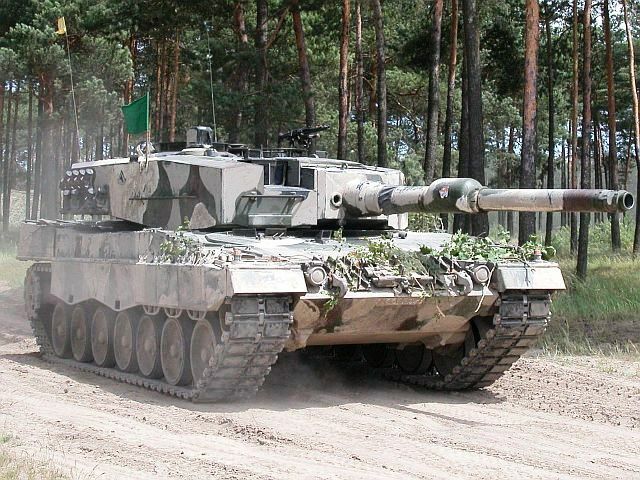 The Leopard 2 has a four-stroke, 12-cylinder multi-fuel, exhaust turbo-charged, liquid-cooled engine. 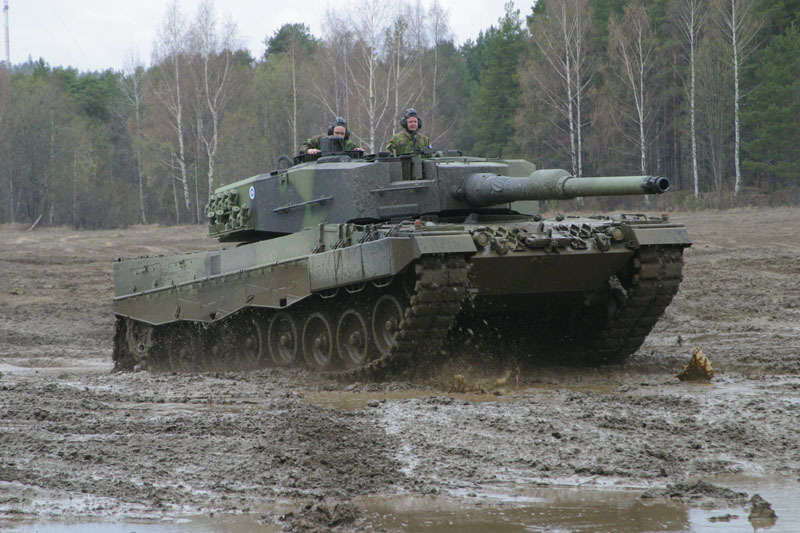 The hull is made of spaced multi-layer armor and divided into the driver's compartment in front, the fighting compartment in the middle, and the engine compartment in the rear. Standard equipment includes an NBC system, powerpack preheating, crew compartment heater, fire-extinguishing system, electric bilge pumps, and a hull escape hatch behind the driver. The driver sits on the right front with three periscopes and has a hatch cover opening to the right. Some ammunition is stored to his left. 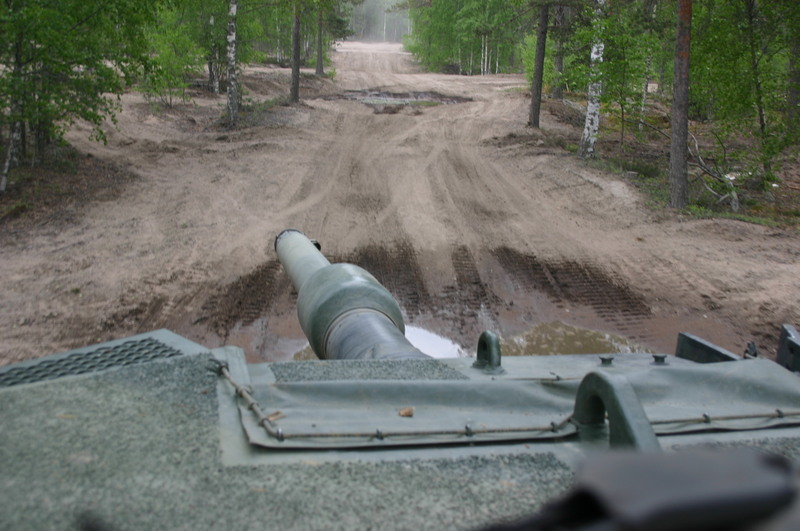 The commander and gunner are on the left of the turret, the loader on the right. The commander's hatch has all-around periscopes and a circular cover opening to the rear. In front of the commander's hatch is a stabilized panoramic periscope. Another periscope on the roof is for the gunner. The loader on the left has a single periscope and hatch cove opening to the rear. On the left side of the turret is an ammunition resupply hatch. There is a stowage basket on the rear of the turret. The torsion-bar suspension supports dual rubber-tired road wheels, four track return rollers, and rear drive sprocket. Steel-reinforced rubber skirts cover the rear two-thirds of the tracks. The front third are covered by special, thick armored boxes. 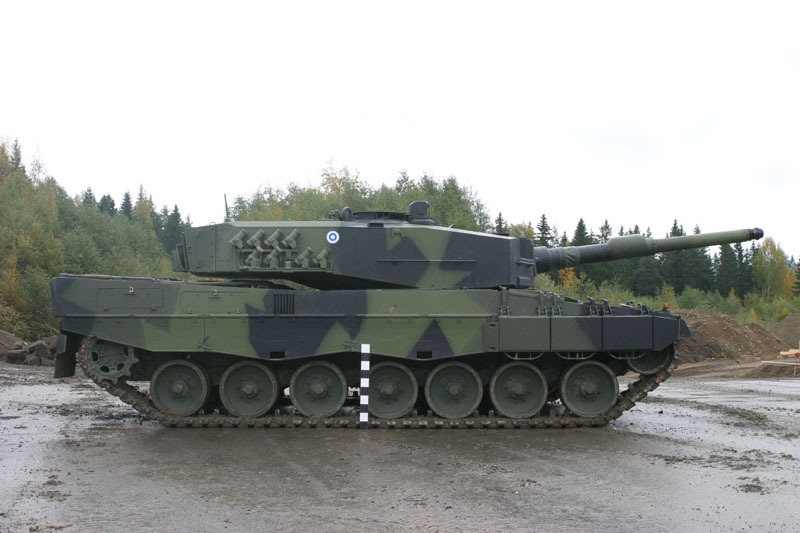 The Leopard 2 is characterized by it's bulky, angular appearance and very high automotive performance. Seven evenly spaced road wheels. Grenade launchers on the rear side of the turret. Two circular exhaust louvers on the top of the rear of the hull. Front three panels of track sideskirting are straight. Three rear skirts have jagged or wavy design. Sides of hull are flat and vertical (squared). Upper and lower glacis form a straight edge. Driver's compartment located at the right front. Loader's hatch on the left side of the turret. Large, slab-type turret with flat surfaces, angular appearance, and large overhang in rear. Turret centered on the hull. Turret has a cutout to the right of the gun mantle. Long hand rails on the left and right side of the turret. 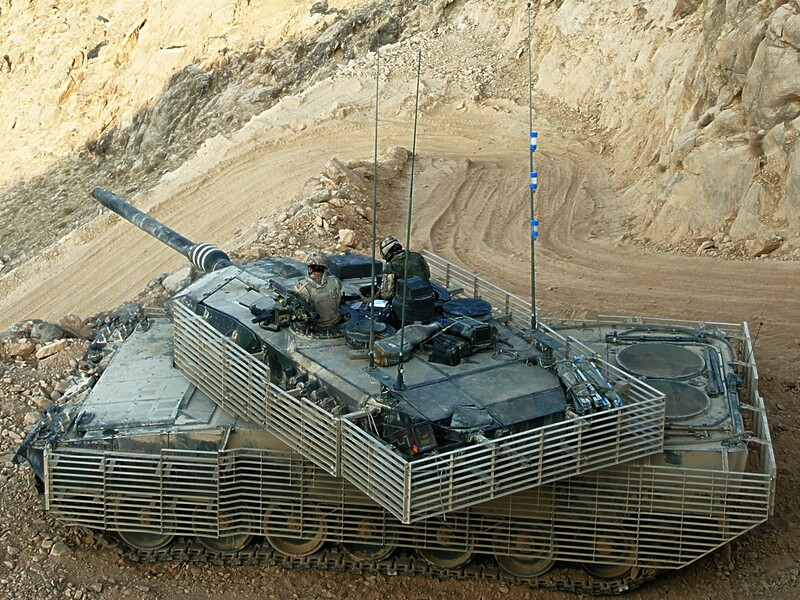 Shorter cargo rails on the left and right of the turret frontal armor. Two round hatches in line in the center of the turret roof. Tank commander's hatch on the right side. 120mm gun with thermal jacket and MRS collimator. Rounded bore evacuator aft of center. Coaxial machine gun port to the left of the main gun. Panoramic sight mounted forward of the commander's hatch. Gunner's sight is recessed into the right front of the turret. Telescope port at the right of the main gun. 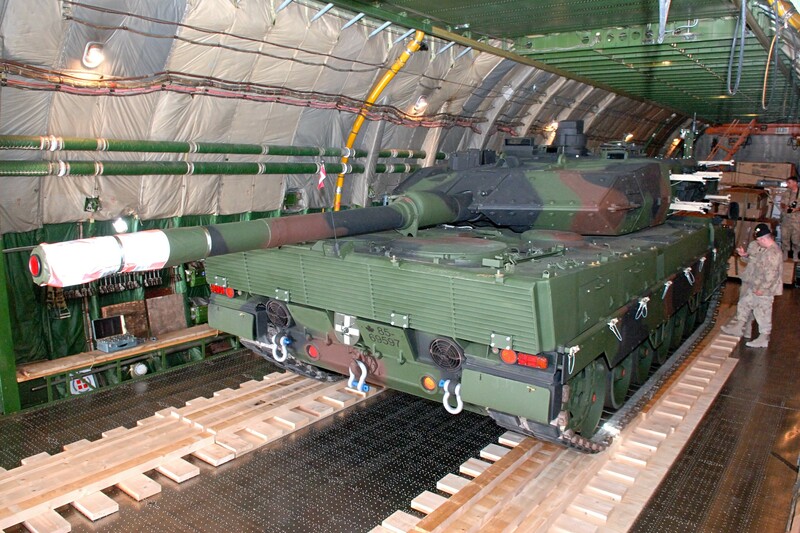 A variety of upgrade programs and options are available for the Leopard 2. 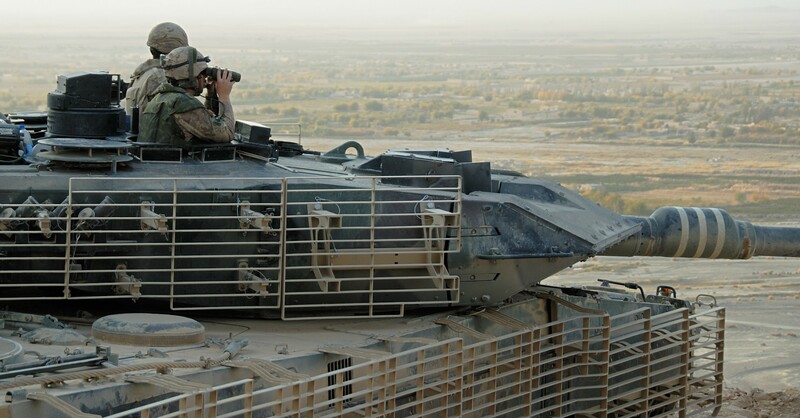 These include the Atlas Elektronik Vehicle Integrated Command and Information System (IFIS), a digital command and information system. 1979. Original production model. See data above. Minor changes, as well as fire control system upgrades. Upgrade with spaced armor added to turret front, and increased armor on hull and side skirts. Other improvements include improved stabilization, suspension, navigation, fire control, and hatch design. 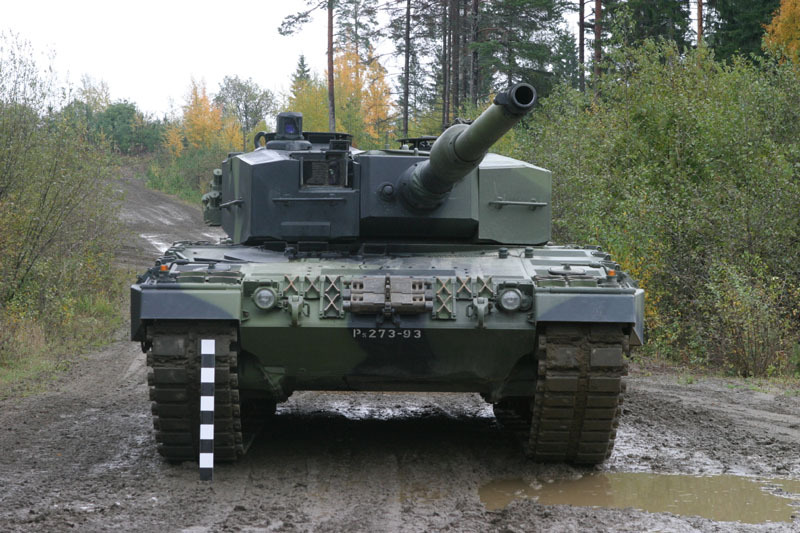 The Leopard 2A6 features a longer 120mm L55 smoothbore main gun. 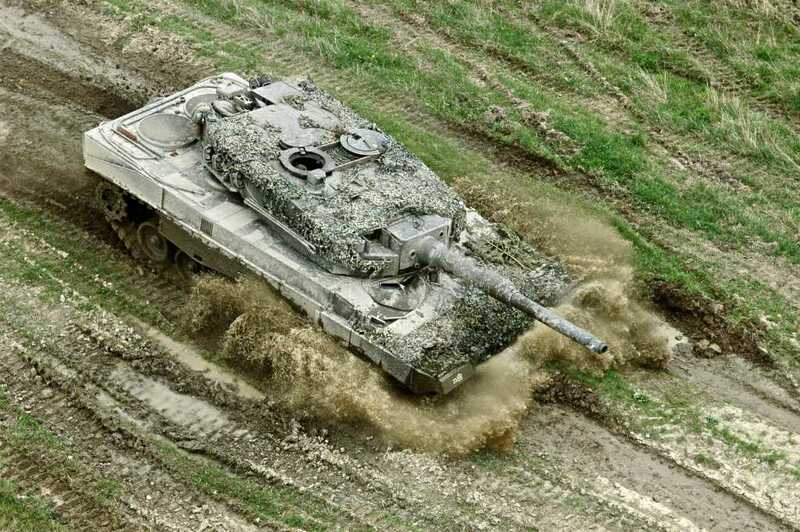 The Leopard 2A6M has enhanced mine protection for the hull bottom. Uses indigenous equipment. 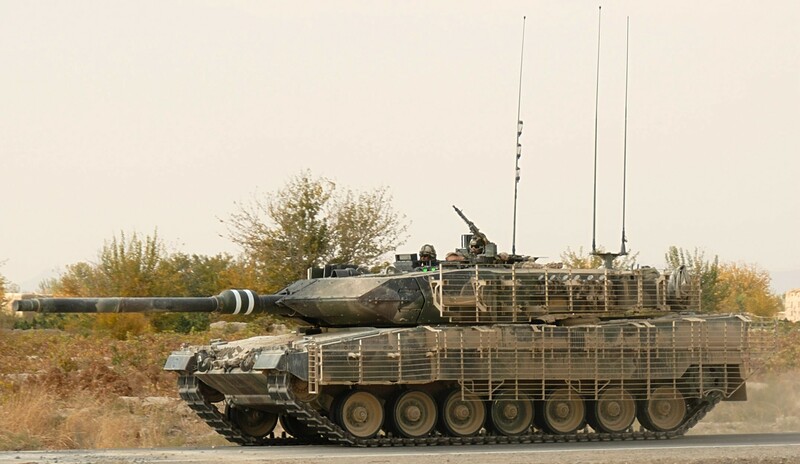 The Dutch Leopard 2s have different 7.62mm machine guns, smoke dischargers, passive night periscope for the driver, radios, and intercom equipment. 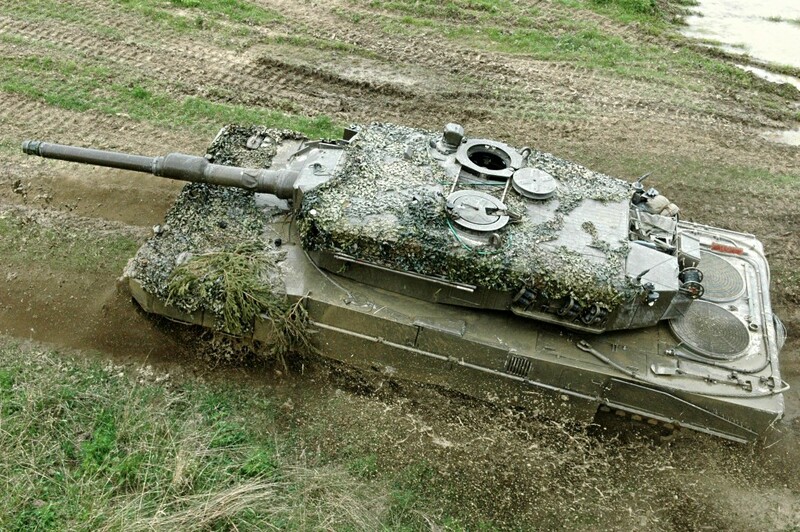 Swiss Leopard 2s are similar to the German Leopard 2s. 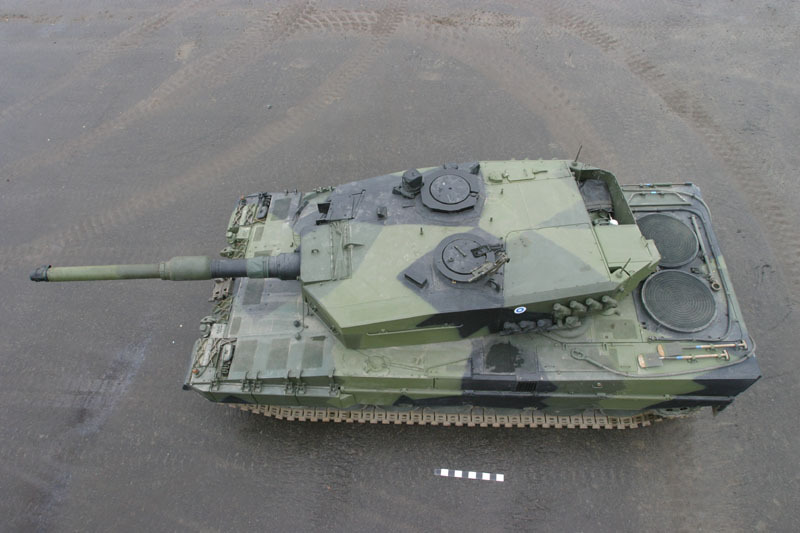 The Swiss Panzer 87 Leo, as it is usually called, has Swiss radios, antennas, and machine guns, an improved driver's hatch, a digital computer instead of the analog computer, a fire/explosion detection and suppression system for the crew compartment, an improved NBC protection system, hydraulic track tensioning units, a Baird passive night driving periscope, optical master warning for the driver when driving with the hatch open, and some other minor modifications. 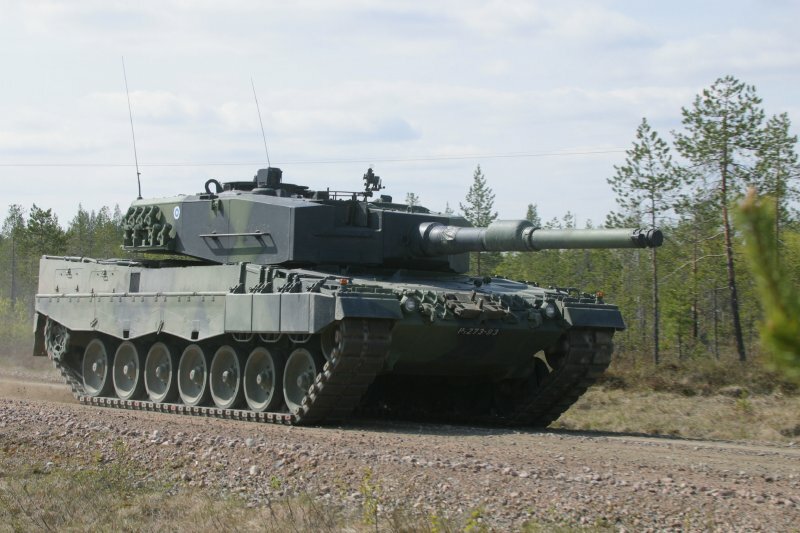 Swedish-licensed variant resembling 2A5 with an indigenous turret and other upgrades. 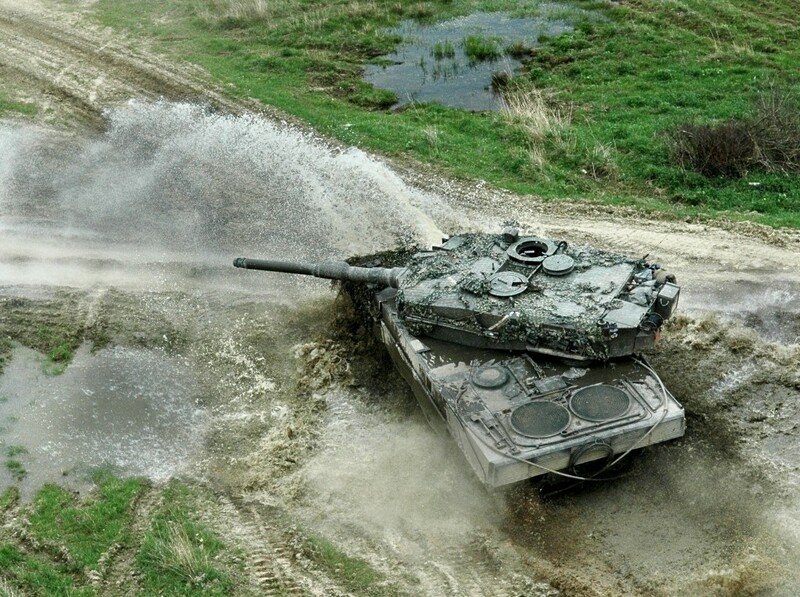 The tank features French Galix active protection system and improved command and control. 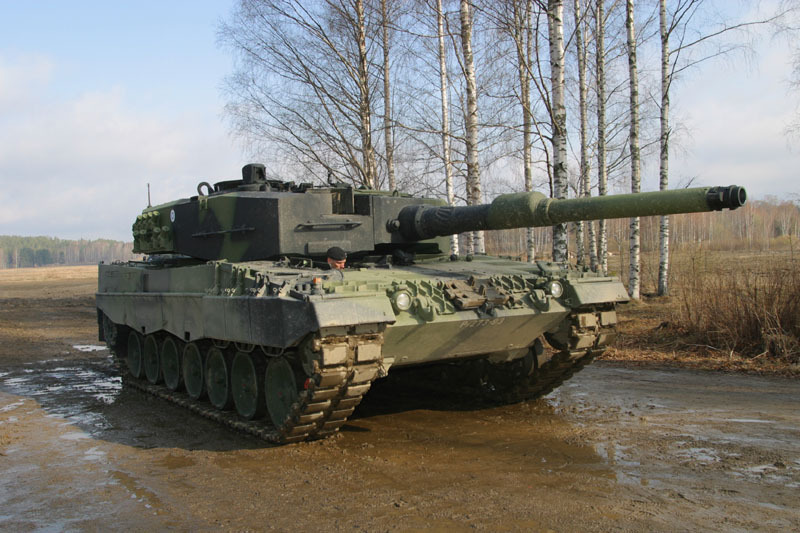 With additional armor, Strv 122 will weigh 62 mt. Last updated: 14-FEB-2008: Added more photos and data. 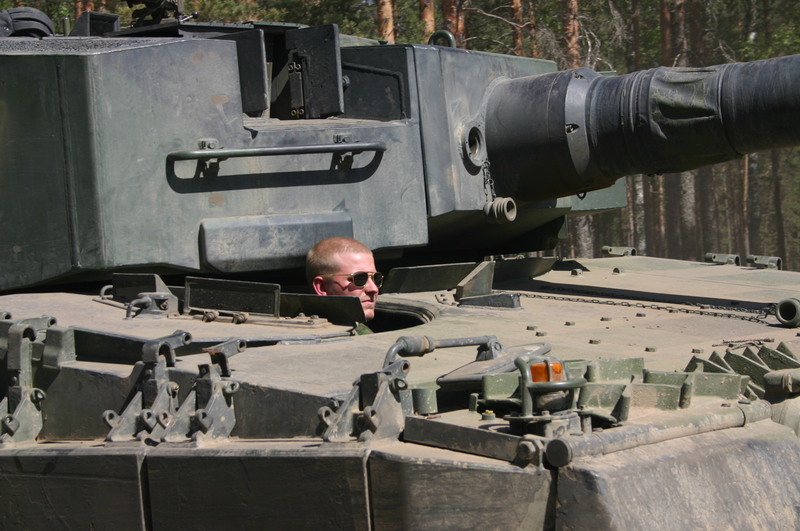 IN0535 Vehicle Recognition (Friendly Armor), Edition C.